As you know on Wednesday, 21 February 2018, Billy Graham went home to be with the Lord whom he served with his life for 80 years, preaching the Gospel of the Lord Jesus Christ. We take comfort knowing that Mr Graham is alive more than ever—in the presence of his Saviour. The last few days have been astounding. 2,500 people gave an indication of their desire to turn to Jesus in one day last week. Last Saturday saw some 3,000 log onto billygraham.org.uk web page to find out where they could view his funeral. The United Kingdom, including Haringey, held a special place in Billy Graham’s heart and was the site of a milestone outreach in 1954. Churches across the nation will be streaming his funeral service live this Friday, 2 March. 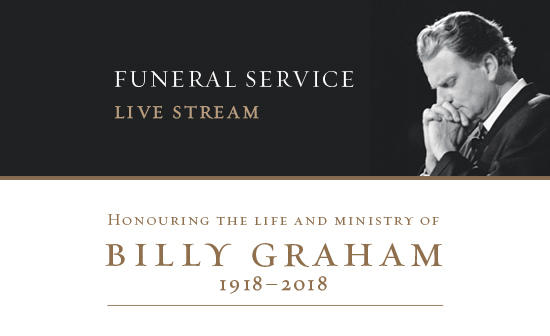 Freedoms Ark has been approached by The Billy Graham organisation to host a live streaming session for the funeral. The Live stream will take place on our premise at the Dream Centre, Tottenham Town Hall, Town Hall Approach Road, London, N15 4RY. Please join us and others around the world in honouring Mr. Graham’s life and ministry. The funeral starts at 5pm GMT and I am told it will last around 2 hours. The funeral will be an evangelistic event as well as a celebration of Dr Graham’s life. You can expect an upbeat, strong gospel message. Please also use this opportunity to invite friends and family to hear the Good News of Jesus Christ. Please encourage your congregation to bring friends and family who need to hear the life-changing Gospel message as it is proclaimed during the service. Lee Searle, Director of Ministry, Billy Graham Evangelistic Association UK will be with us on Friday during the live streaming and will give a brief address at the end. Refreshments will be served at the end of the event. Billy Graham’s one purpose in life was to help people find a relationship with God that comes only through knowing Jesus Christ, and his desire would be the same in his passing. Thank you for your partnership in the Gospel.